Bridal & Bridesmaids Lace Clutch | Wedding Accessories & Bags | Handmade Bridal Wedding Clutches by ANGEE W.
The original makers of photo lined clutch purses, ANGEE W. is famous for personalized clutches made with delicate laces, satins and silks. Our bags are popular wedding and bridal shower presents. Brides, bridesmaids, mothers and mothers-in-law all appreciate receiving such a beautiful gift. A clutch with a personal story in the palm of their hands. Let us help you tell your story! The shop is named for Angee, the mother in this mother-daughter team, as it was her original creation that inspired the entire enterprise. In 2008 Angee made a beautiful feather clutch bag for her daughter Vincci to wear to her best friend’s wedding. 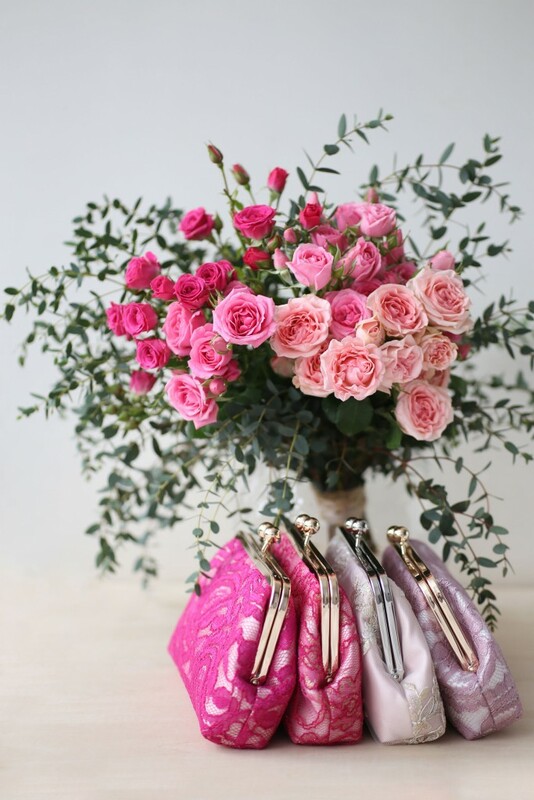 The bag was later sold on Etsy and six years later, the mother-daughter team has made thousands of customized and personalized photo clutch purses for brides, bridesmaids and their mothers to wear on their big day. We love silk, satin, laces and tulle. We also aim to work sustainably, so Angee & Vincci has also launched a new line of eco-friendly clutches that repurpose precious vintage and cultural heritage textiles from Japan, China and Bhutan. This collection of “Heritage ReFashioned” clutches gives a new life to forsaken, forgotten and rejected textiles rich with cultural heritage. We artfully pair colourful cultural heritage with sustainable fashion. Most ANGEE W. clutches are mailed in a cotton dust bag and a environmentally friendly double walled kraft paper gift box, ready to be given. Angee has more than 30 years of textile and fashion manufacturing experience under her belt and brands she has worked for include Abercrombie and Fitch, GAP, Land's End and Liz Claiborne. She is not only the “Mother” at ANGEE W., but she is also Chief Designer and Master of Craftsmanship. Vincci holds an Honours Bachelor of Arts from the University of Toronto, Canada and is responsible for marketing, communications and part of the design work at ANGEE W. Having lived on three continents —Africa, Asia, and North America — Vincci draws inspiration from her multi-cultural background, creating with both traditional and exotic materials. 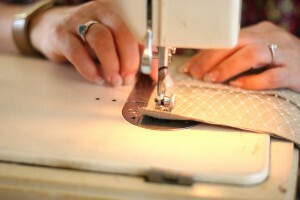 We’ve made over 5000 handmade clutches with our hands since 2009. This is a recently acquired Elna sewing machine for our more delicate work with laces and millinery veils. Our handmade business started with our trusty 1970s Singer home sewing machine. A pair of quality tailor’s shears is one of our best tools in the workshop. It could lead to a very long day without it. 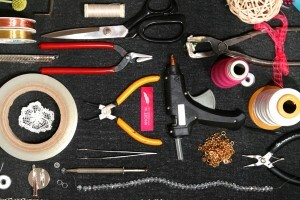 Our hardware tools are also vital to every single step of our bag making process. Of course, the sewing basic. 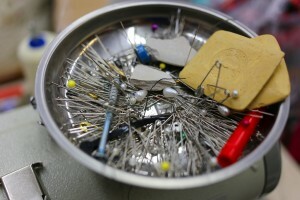 We love our pins and chalks on a metal plate placed securely on top of the sewing machine with a strong magnet.